It's not quite human cloning, but it's close. Researchers reported using a variation of somatic cell nuclear transfer (SCNT)  the same technique that created Dolly the sheep, the first mammal to be cloned, from a skin cell of a ewe  on human cells. SCNT involves replacing the genetic material of an egg cell with the DNA from a mature cell (a skin cell, for example). The egg is then stimulated to divide, and if it develops fully, produces a genetically identical clone of the animal from which the mature cell was taken. In the latest study, reported in October, scientists at the New York Stem Cell Foundation modified the technique, combining the DNA of an adult human cell with the genetic material of an egg  rather than replacing the egg's DNA. Previous attempts to clone human cells using SCNT had failed, but something about keeping the egg's DNA appeared to facilitate cell division and allow the generation of stem cells. 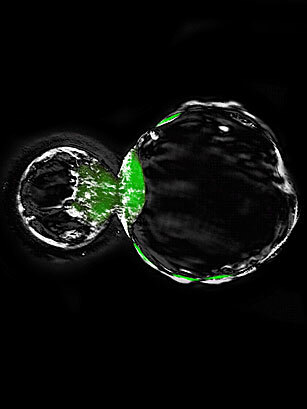 The stem cells weren't quite normal, however, since they contained an extra set of chromosomes, from the egg. Next, the researchers hope to find a way to silence or eliminate the extra set of DNA. The process is promising because it can potentially yield stem cells  which may one day treat diseases such as spinal cord injury and Parkinson's  that not only match their donor, but also obviate the need for an embryo.